How about keeping close watch on computer system in your absence???? Mac keylogger software facilitates to trace computer system activities performed on PC in hidden mode. PC monitoring software provides option to trace USB device insertion or removal action and generate log report of typed system activities in desired text or html file format. Macintosh based keystroke recorder tool provides extraordinary features to monitor typed username password or login credentials of any email account. Mac keylogger software facilitates users to spy voice chat conversations and monitors all visited or typed website URL. Mac keylogger program provides facility for system administrator to keep close watch on employee system activities performed during office hours. PC monitoring software traces all clipboard copy paste action, application accessed even when you are far away from your system. » Mac keylogger software runs secretly in hidden mode to trace voice chat conversation. » Software monitors USB device insertion and removal action with timing details. » Keylogger for Mac OS X tracks composed and sent email details. » Visual surveillance feature captures system screenshots at regular interval of time. 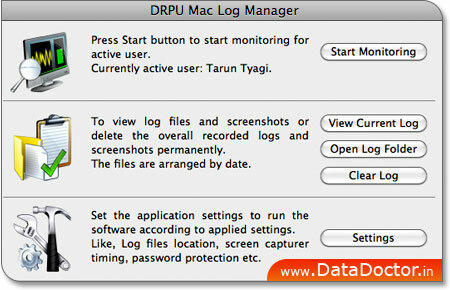 » Mac keylogger software monitors your PC and does not affect system performance.